This entry is part 1 of 8 in the series Magento Projects. Later posts include Magento Configuration Search, Layout Unremove 1.0.1: Fix for Caching Bug, An Unremove Tag for Magento Layout XML, Reference for Magento Block Action Methods, Django Routes with Magento and Simple Page, Tar Archive to Magento Connect, and Magento TinyMCE and HTML5. I’ve always found it a little odd that Magento doesn’t ship with a module listing UI out of the box. One weekend coding project later, and I’m happy to present the Module List module. The Module List module is a simple Magento module that will list out each code module installed into a Magento system. This is distinct from Magento Connect, which is a package manager. Connect packages can contain Magento code modules, but they’re separate entities. Checkout the screencast for an overview, or download your copy right now. I’ll be uploading to Magento Connect shortly, so keep an eye on my twitter feed if you’re waiting on that. If you run into problems please let me know in the comments. If you’ve found this module at all useful, you may be interested in my commercial products. Commerce Bug is a full-featured Magento debugging extension that will save you and your team hours everyday. 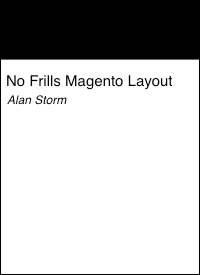 No Frills Magento Layout is the only ebook that fully explains the Magento Layout XML system. Both are guaranteed to make you a better, faster, Magento developer.